Cook noodles according to package directions. Drain. Stir in 1 tbsp. cooking oil to keep noodles from sticking together. Transfer to a serving platter. Keep noodles warm by tenting it with foil. Heat 1 tbsp. oil in a skillet, make a thin omelet of the egg. Cut it into strips. Set aside. Drain mushrooms, discard tough stems, and slice thinly. Set aside. Combine pork, patis and cornstarch. Heat 2 tbsp. of the oil in a skillet and stir coated pork pieces in oil over medium heat. Cook until pork is firm. Add bean sprouts, sliced mushrooms, soy sauce and chicken stock. Stir and cook for 3-5 minutes, or until bean sprouts are done. Remove from heat. 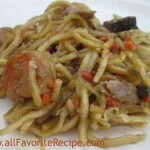 Pour vegetables-meat mixture over cooked noodles in serving platter. 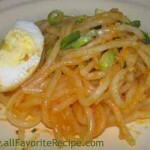 Garnish with fried egg strips and minced green onions. 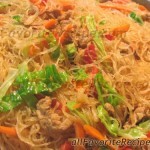 Have You Tried These Other Pancit Recipe ? Wow!!! Sa picture pa lang sarap na!!! 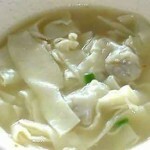 …LANGHAP SARAP!!! Yum, yum. Yummy!!! Bless our food this day, Lord, and use it to nourish, heal and strengthen our bodies. Amen. 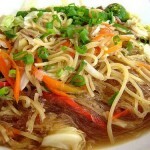 Wisegeek - What is Pansit?